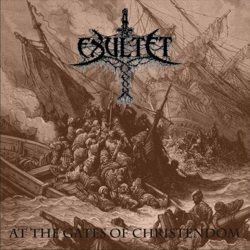 Italian epic folk black metal band Exultet from Sicily will release its fifth full-length album, entitled “At the Gates of Christendom“ via the American label Martyrdom Records. After the departure of Argoth from the band, Farz decided to continue Exultet as a solo project and began writing new songs. The music continues in the same style, bringing together elements of Arabic and medieval folk, Viking and epic battle blackened metal. The first part of ”At the Gates of Christendom” describes the Otranto invasion by the army of the Ottoman Empire in 1480 and the second part the decisive battle of Lepanto, won by the Holy League in 1571. The album contains 7 tracks with a total playtime around 50 minutes, including as bonus track a re-recorded version of “The Norman Ascent” for the occasion of the 10 year anniversary of the debut album “Urbs Felix” from 2004. “At the Gates of Christendom“ is already available for pre-order at their label’s web-store in a jewel-case edition CD limited to 100 copies with a 11×17 poster. Cover artwork and album tracklist are already revealed, while the official release date will be in the end of 2014 or the beginning of 2015.